Replies: 359 (Who? ), Viewed: 147169 times. This tutorial is somewhat outdated and should be used for reference only. Instead, please download the pre-compiled versions of the SuperCAW executable. To install, drop the .exe in your CAW folder ([Install location]\Electronic Arts\The Sims 3 Create a World Tool) to replace the existing executable. Click to run SuperCAW. 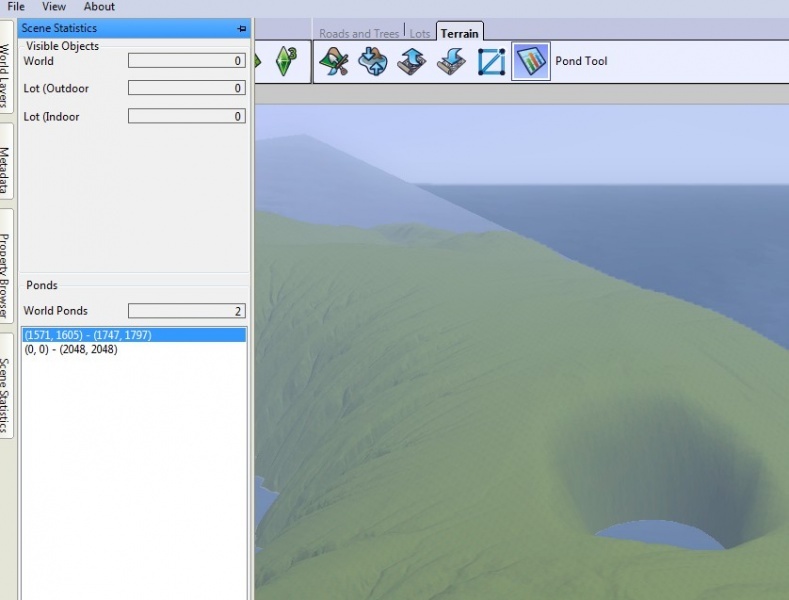 It has been discovered that the Sims 3 Create-a-World Tool Beta has many hidden developer tools that are not included in the consumer version. I have written a tutorial to explain how to patch your copy of CAW to unlock these hidden features. For gameversion 1.67: I recommend to download the latest compiled executable from Simlogical. Simply backup your existing CAW executable and replace it with the downloaded SuperCAW executable. The following article remains archived on the Wiki for information only. Please read the 'Notes' section of that tutorial! Nilixis has written a Spanish version of this article- see it here! Registration required.Thanks Nilixis! Jawusa has written a German version of this article- see it here! Thanks, Jawusa! joaoh2009 has written a Brazilian-Portugese version of this article- see it here! Thanks, joaoh2009! simsdetoi has written a French version of this article- see it here! Thanks, simsdetoi! Please use this thread for any questions you may have regarding this process. Full credit to atavera (otherwise known as atavera (retired) or 'atavera who creates wrappers for S3Pi'), who is the person to discover these features and compile the patch. #2 6th Feb 2012 at 3:24 PM Last edited by bakafox : 6th Feb 2012 at 4:36 PM. Am using WinXP, am the administrator of it, so not sure what's happening. Same things are red to me as to Querin below me's screencap, too. I have a problem with patching CAW with this method (My CAW is version: WBVersion = 1.13.7.014037). Those red objects in File patch window are causing troubles. First I've got error mesage that file could not be found. Then the second error message (shown on screenshot). After clicking all error messages (two for each of red objects), I have a project that cannot be debugged by Microsoft Visual C# 2010 Express. Am I doing something wrong or is there a problem with my system ? I followed the tut and it's working fine for me! Ok, I have to get used to this tool, because there are so many new objects and effects and the tools are still a bit unusual, but the Water Plane Tool is great! Ok Armiel may have found problem! We have to run tortoise as admin. my XP just isn't believing me when I say I am admin. Thank you, got it installed. The same will probably happen to anyone who are not English (as language). So again, are notified. Thank you for testing, guys! Ha, of course I don't have my copy of CAW installed to the default location, and so UAC is not interfering. But for those people who do have CAW installed to the default location (Program Files), full administrator access WILL be required, which means running as an administrator, as you have all found out. I'll add that to the tutorial now, thank you for all solving this for me! Armiel- Do not panic, as of course you can choose whether to run the new patched version of CAW, or the original version. The original executable will still be in your native language as you have not changed that at all; all that you have done is to create an additional exe. Test it to see if it works! Then you can just use the modded CAW for when you want something specific (water planes, extra effects etc.,) and the original when you want to work at speed. Will have to plunge myself in to all of this once I have my set out of my hands, I just installed it now to see if I had same issues as Baka. I'm on 64bit W7, CAW installed to default, if that helps any. Thanks Armiel, that helps a lot- I've added a note about the language to the tutorial, too. Thank you everyone for testing, please keep the reports coming! It's good to know what works and what does not, as then I can edit the tutorial to make it easier to understand. I still can't patch/upgrade CAW. Running as administrator or reinstalling CAW hasn't helped a bit. I've even installed it to default location, hoping it will help, but no - still the same errors. Ok, well I uninstalled CAW, and tried reinstalling it both first just in a new folder in C drive, then into a folder in My Documents. Am still unable to get the merge to work, some files remain in red and are 'not found' and I still get patch error messages. So even without it in default, can't get it to work without running as admin =/ Which unfortunately my XP won't let me do, as it says I need a password that I don't know and didn't even think existed. Bleh. @Querin and Baka- to clarify, if you are using Vista or Win 7 then installing to the default location will mean that you DO need to run as an administrator. Also, your install of CAW must be installed to the same location as The Sims 3 game. So if you have CAW installed in C:\Program Files\ Electronic Arts you must have CAW installed to C:\Program Files\ Electronic Arts as well. Right click once they are all selected, and choose 'remove'. Then, close ILSPy and start the tutorial over again, making sure that you run ILSpy, Tortoise Merge and Visual Studio Express as administrator each time. Unfortunately I'm running XP, and can't run as admin =/ so guess I am out of luck til desktop comes back from the shop. If you're on XP, Baka, 'run as admin' doesn't apply (as long as you are on an administrator account), as there is no UAC. Try once more with a fresh start, first removing the entries from ILSpy as in my image. Can I please translate your tutorial into Spanish and use your pics for a Spanish speaking CAW forum? Thanks for trying to help me Simsample, but it's still not working. Just to be clear: I'm running Win7 64-bit as administrator and, just to be on a safe side, each progam I 'run as administrator'. Both CAW, Sims 3 and Late Night are on the same partition (not system partition). I've tried every solution from this thread ans still have the same errors. 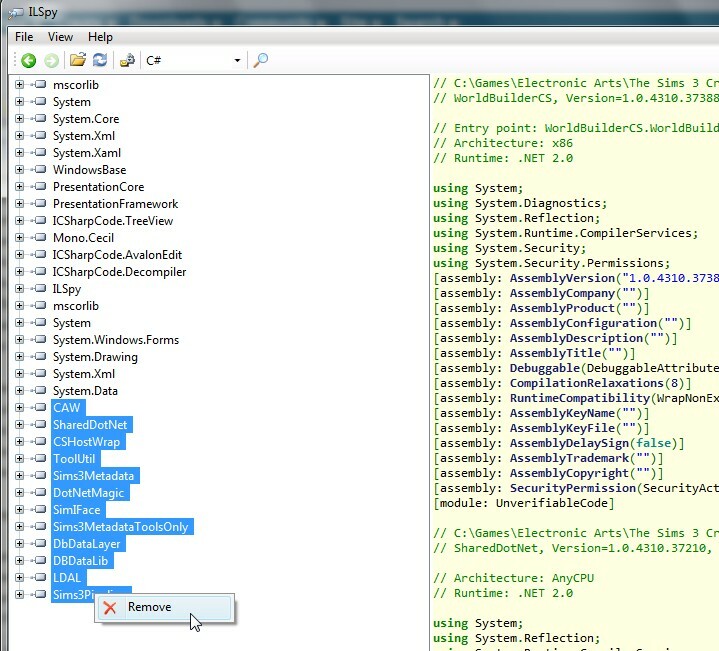 I'm starting to think that some libraries in my system are preventing ILSpy from extracting source code properly. Have reinstalled/unistalled CAW several times and deleted all those things from the ILSpy twice. I had been using the framework and the link for CAW CC, but I am thinking those must have been destroyed when I uninstalled everything with CAW including all user data? Or might something about how I'd had the virtual link in be causing this problem? Nilxis- I'm glad you got it working, well done! -Please remember that this tutorial is likely to be updated (as I am making adjustments as people test and find glitches in my explanations), so be prepared to update your Spanish version too. -Please don't re-host the patch- give people the link to my download. That way, I can update it should the need arise. -Please make it clear that this patch is for the current version of CAW, and that it will likely not work should EA update. -Please make it clear that people should backup their files first! -Please ask your readers to post problems/ glitches to this forum (they can use Google translate) as this will help me to improve the tutorial. -Please make it clear that all credit is due to atavera, who devised the patch and discovered the hidden features in the first place. All I did was to write atavera's instructions into a tutorial. -And lastly, please send me a link, and that way I can link to it in my tutorial for our Spanish speaking friends to see. Bakafox- I can't see that this is a problem with XP, so there must be some way that your install is varying from mine. Could you give me the following information please? Not sure how much of this is relevant, but it will help me to gain a better understanding, anyway! Querin- Sorry, missed your reply! Could you supply the same info as I asked Baka for too please? Querin- Is your version of CAW running without glitches? I have a feeling that your problem may be related to a version mismatch- according to what we know, it seems that if you are only running Late Night, you should not be able to run a newer version of CAW than 1.11.9. Could you please confirm for me what your compatibility versions are in your basegame and LN Default.ini files, as outlined here? If I'm guessing right then it means that this may not work for your game. Nilxis- Thank you, this will be most helpful! "There were build errors, would you like to continue and run the last successful build?" CAW is running fine for me though I haven't set back up CC framework stuff so am not seeing any of that. Baka- as with Querin, I suspect a version problem. Your WA, Ambitions and Late Night games are unpatched, as are HELS and OLS. For the game (and choosing mods) this is irrelevant as the game runs from the basegame executable, so the only thing that matters is the basegame version. However, we have found that people are having problems such as EIG crashes and general instability which is improved by having all EPs/SPs patched. If you have time, could you possibly test that theory for me? You would need to backup ALL of your CAW and Sims 3 userdata (copy Documents\ Electronic Arts\ The Sims 3 and Documents\ Electronic Arts\ The Sims 3 Create A World Tool to a safe place) and then download and install the latest patches for each of those EPs. For the ones ending in 7, you need the digital download patch. It seems likely that your CAW version effectively does not match the version that atavera's patch is intended for. As strange as it sounds, this version of CAW runs perfectly with my Sims. Furthermore - it's the only version that shows 'Effects' in metadate window. My version numbers are taken from Default.ini files. Edit: I have the same C# error as Bakafox. Querin- what does the 'WorldBuilderCompatibilityVersion' say in your basegame and LN? I'm betting that they do not match, which may be why this is failing for you. Not sure what you mean by the effects in metadata?